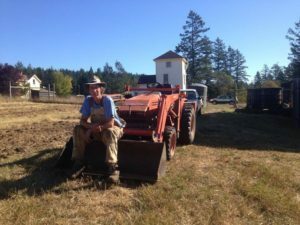 When our team assembled in late September, including part-time team member Patrick Bennett with his tractor, it was just a bit too late for us to get a fall crop in the ground. But we were able to lay out a general pattern of garden blocks and pathways and till a little over an acre. When it didn’t rain as predicted (no, the forecast in the upper Northwest was wrong?! You’re kidding! 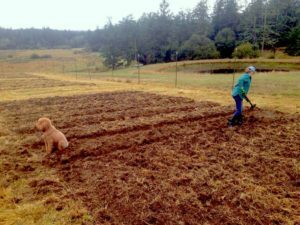 ), our plans to sow an overwintering cover crop was delayed, and all the grasses, yarrow, thistle, common sorrel, and other pasture plants, but mostly grass, began to take hold again. So when a light rain began a few weeks after our first pass with the tiller, we did a second pass and followed behind with our cover crops. We are testing out two different mixes. Peaceful Valley’s OG Soilbuilder mix consisting of bell beans, oats, two types of peas, and three types of vetch is doing very well. With all this January rain, and the days getting longer, everything is really starting to grow pretty quickly. The other mix was one that we put together of 50% Austrian peas, 25% vetch, and 25% rye. Initially it seemed like it was overtaken by grass seed and wasn’t going to take very well, but all of a sudden, it’s starting to grow faster than the grass and take over. Yippee! While all that was happening, we also ordered three types of garlic and planted about 20lbs altogether. The California Early White, a mild softneck garlic, was up in what seemed like weeks from planting. The other two are Spanish Roja and Music, which are much more pungent and spicy hardneck garlics. These two just began to peek their heads out towards the end of January and are looking pretty good. We also planted a few rows of onions to try and overwinter as an experiment. We planted Walla Walla and Red Burger sets. They aren’t as mushy as I expected after our frosts, and may actually bulb out. This would give us some pretty interesting information for our site, considering I’d never heard of anybody overwintering onions this far north. More likely, they will go to seed, and we will harvest the seeds for a next round of summer planting. 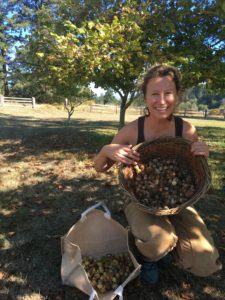 Around the same time, we harvested from the existing hazelnut trees on the property and ended up with a few pounds of nuts. I was delightfully surprised to find that there are no squirrels, and even more shockingly no Stellar Jays!? We’re definitely going to be planting more hazelnuts, as well as walnuts, a few chestnuts, an almond or two, and oaks out in the pasture. We spent the dreary and short days of January pouring over the colorful pages of seed catalogues from Siskiyou, Uprising, Strictly Medicinals, Johnny’s, Baker’s Creek, and a few others. Our seeds have arrived, and the little greenhouse is already filling up, along with our microgreens setup, which will produce its first crop within 2 weeks. On top of all that, we have a pretty sweet collection of fruit, nut, timber, and ornamental plants and trees that we’re working into the bigger picture of the farm. More on all that another time.